A time control is a mechanism in the tournament play of almost all two-player board games so that each round of the match can finish in a timely way and the tournament can proceed. Time controls are typically enforced by means of a game clock. Time pressure (or time trouble or zeitnot) is the situation of having very little time on a player's clock to complete their remaining moves. The World Chess Federation FIDE sets a single time control for all major FIDE events according to the handbook: 90 minutes for the first 40 moves followed by 30 minutes for the rest of the game with an addition of 30 seconds per move starting from move one. Exceptions can be made, though the Candidates tournaments for the World Championship have been played at 120 minutes for 40 moves, followed by 60 minutes for 20 moves, followed by 15 minutes for the rest of the game, with a 30-second increment starting on move 61. The amount of time given to each player to complete their moves will vary from game to game. However most games tend to change the classification of tournaments according to the length of time given to the players. Shorter time limits, which do not afford due consideration to moves, are afforded a lesser degree of importance. Indeed, shorter limits are normally given special names to distinguish them. 'Lightning' is the quickest limit, then 'blitz'. Chess has an 'active' category after this. In chess, Lightning refers to 3 minutes or below, blitz refers to between 4 and 15 minutes, and Active is between 15 and 30. By way of contrast, for Go anything under twenty minutes could be considered blitz. The exact approach to using a game clock to regulate games varies considerably. This is the simplest methodology. Each player is assigned a fixed amount of time for the whole game: once a player's main time expires, he loses the game. Each player's clock starts with a specified time (e.g. 1 minute, 10 min etc.). While Player 1 is deciding a move, player 1's clock time is decreasing and Player 2's clock time is increasing. This is similar to how an hourglass works; sand empties from one container and fills into the other. Moving slowly gives your opponent extra time. The sum of both clocks will always remain the same. There is no maximum amount of time allotted for a game with this timing method; as long as both players play quickly, the game will continue until its natural end. When time runs out on one player's clock the game is over and that player loses. This is very uncommon to be used in chess tournaments outside of certain websites. Here the game time is separated into two basic domains: the main time, and the overtime. To switch between the two requires some trigger event. Often this is the expiration of the main time. In chess, reaching a fixed number of moves can trigger the gain of a fixed amount of bonus time. This is the general chess rule and it usually occurs in long games after the 40th move: e.g. 120 minutes to complete the first 40 moves, and another 30 minutes to complete the entire game. Byo-yomi (秒読み byōyomi) is an extended time control in two-player games, specifically shogi and go. The word is borrowed from Japanese; the term literally means "counting the seconds", or more generally, "countdown". After the main time is depleted, a player has a certain number of periods (for example five periods, each of thirty seconds). If a move is completed before the time expires, the time period resets and restarts the next turn. Now if a move is not completed within a time period, the time period will expire, and the next time period begins. This is written as <maintime> + <number of byo-yomi time periods> of <byo-yomi time period>. Using up the last period means that the player has lost on time. In some systems, such as certain Go title matches, there is no main time; instead, the time used is rounded down to the nearest whole increment, such as one minute, and the actual counting of time occurs toward the end of one player's time. A typical time control is "60 minutes + 30 seconds byo-yomi", which means that each player may make as many or as few moves as he chooses during his first 60 minutes of thinking time, but after the hour is exhausted, he must make each move in thirty seconds or less. To enforce byo-yomi, a third person or a game clock with a byo-yomi option is necessary. In professional Go games and many amateur tournaments, a player has several byo-yomi periods, for example five periods of one minute each. If a player makes his move within a one-minute period, he retains all five periods for his future moves. If a player oversteps one minute, he starts the following move in the second rather than the first byo-yomi period. In effect, the player has one minute per move plus four extra one-minute packets which may be used as needed, e.g. four moves of two minutes each, or one move of five minutes, or any other combination. When analog game clocks are used to enforce byo-yomi, it is more convenient to assign additional time for a block of moves, rather than for each move. In Canadian byo-yomi, a player typically gets 5 minutes for 10 to 20 moves. The IGS Go server uses a similar system, but the byo-yomi time is variable and always covers 25 moves. Thus the time control "20 minutes + 15 minutes byoyomi" on IGS means that after the initial 20 minutes of thinking time are over, a player is granted 15 additional minutes, which may be spent however he chooses. If these minutes expire before he has made 25 more moves, he loses. If he makes 25 more moves in less than 15 minutes, he is granted another 15 minutes of byo-yomi, and so on indefinitely. Canadian byo-yomi imposes a certain average speed of play, but allows to spend more time to ponder on difficult moves. Several byo-yomi periods in one move per period variant (also known as Japanese byo-yomi, though that is a bit of tautology) serve essentially the same purpose, albeit to a lesser extent. Unused time during one byo-yomi period does not carry forward to future moves. This is in contrast to the Fischer clock often used in chess, with designations such as "5 minutes + 12 seconds per move". Under this time control each player has twelve seconds added to his clock after every move, starting from the first move, regardless of how much time he spends on each move. Thus if a player thinks for eight seconds before making his first move, he will have five minutes and four seconds on his clock after making it. After using all of his/her main time, a player must make a certain number of moves within a certain period of time - for example, twenty moves within five minutes. In Go, players stop the clock, and the player in overtime counts out the required number of stones and sets the remaining stones out of reach so as not to become confused, whilst the opponent sets the clock to the overtime period. If all the moves are made in time, then another period of overtime starts - another set of stones and the timer again reset to the overtime period. If all the moves are not made in time, the player has lost on time. This is written as <main time> + <number of moves to be completed in each time period> in . In Progressive Canadian Overtime the required rate of play alters in additional overtime periods - EG 1hour + 10 in 5, 20 in 5, 30 in 5, 40 in 5 etc. These methods require the use a special clock, called a delay clock. There are three main forms which provide compensation for both the time lost in physically making a move and to make it such that a player can avoid having an ever-decreasing amount of time remaining. Simple delay. When it becomes a player's turn to move, the clock waits for the delay period before starting to subtract from the player's remaining time. For example, if the delay is five seconds, the clock waits for five seconds before counting down. The time is not accumulated. If the player moves within the delay period, no time is subtracted from his remaining time. Bronstein delay, invented by David Bronstein. This time method results in the same usage of time as the simple delay. The only difference is that during the turn, the player can see how much time they are using because the clock starts counting down immediately. Once the turn is over, if they have used less than the duration of the delay period, the time is returned as if no time had been used. If the time used exceeds the delay period, the length of the delay period is added to the player's time. Fischer delay (or time increment), invented by Bobby Fischer. When it becomes a player's turn to move, the delay (or increment) is added to the player's remaining time. For example, if the delay is five seconds and the player has ten minutes remaining on his clock, when his clock is activated, he now has ten minutes and five seconds remaining. Time can be accumulated, so if the player moves within the delay period, his remaining time actually increases. This style of time control is common in competitive chess (including most FIDE events), as well as on internet chess servers. The delay is termed an "increment". A time increment can be combined with an overtime format; in this case the game is divided in fractions with separate time controls: like first fraction made of the first 40 moves and next fraction made of all the remaining moves, with a separate time control each fraction, where the rule can be sudden death or increment in either. E.g. FIDE regulations prescribe in many events that for the first 40 moves each player has 90 minutes plus an increment of 30 seconds, after the 40 moves each player is granted an extra amount of 30 minutes to complete the game plus again an increment of 30 seconds each move. Such methods exact a points penalty, or fine, on the player who breaches their time limit. One example occurs in Go, where the Ing Rules enforce fines on breaches of main time and overtime periods. In tournament Scrabble, the time control is standardized to 25 minutes per side with a 10-point penalty for each minute or part thereof that is used in excess, so that overstepping the allotted time by 61 seconds carries a 20-point penalty. In chess, a person will automatically lose if they lose their game on time unless they try a draw claim. (See Rule 14-H in the USCF manual for chess). 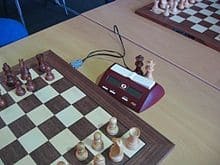 On games servers (like Internet chess server and Free Internet Chess Server) the time control is usually expressed with a formula: time+increment. Where time is a fixed amount of time (in minutes) assigned at move 0 for the entire game, and increment (in seconds) is the amount added after each move. When the increment is 0 the time control turns into a sudden death: so a 5+0 game is a game with sudden death at 5 minutes. When the increment is bigger than 0 the time control is a Fischer delay: e.g. a 2+12 is a game with Fischer delay with 2 minutes + 12 seconds each move. A game can even have a time set to 0: the clock is set to 0 and started after the first move with the increment only on both sides, and each move each player is granted only the increment: a 0+10 is a game where after the first move each player has 10 seconds to move. Sensei’s Library definition of byo-yomi. British Go Association description of how time is called.